Celery leaves are pinnate to bipinnate with rhombic leaflets 3–6 cm (1.2–2.4 in) long and 2–4 cm (0.79–1.57 in) broad. The flowers are creamy-white, 2–3 mm (0.079–0.118 in) in diameter, and are produced in dense compound umbels. The seeds are broad ovoid to globose, 1.5–2 mm (0.059–0.079 in) long and wide. Modern cultivars have been selected for solid petioles, leaf stalks. A celery stalk readily separates into “strings” which are bundles of angular collenchyma cells exterior to the vascular bundles. It occurs around the globe. The first cultivation is thought to have happened in the Mediterranean region, where the natural habitats were salty and wet, or marshy soils near the coast where celery grew in agropyro-rumicion-plant communities. First attested in English in 1664, the word “celery” derives from the French céleri, in turn from Italian seleri, the plural of selero, which comes from Late Latin selinon, the latinisation of the Ancient Greek: σέλινον, translit. selinon, “celery”. The earliest attested form of the word is the Mycenaean Greek se-ri-no, written in Linear B syllabic script. In North America, commercial production of celery is dominated by the cultivar called ‘Pascal’ celery. Gardeners can grow a range of cultivars, many of which differ from the wild species, mainly in having stouter leaf stems. They are ranged under two classes, white and red. The stalks grow in tight, straight, parallel bunches, and are typically marketed fresh that way, without roots and just a little green leaf remaining. In Europe, another popular variety is celeriac (also known as celery root), Apium graveolens var. rapaceum, grown because its hypocotyl forms a large bulb, white on the inside. The bulb can be kept for months in winter and mostly serves as a main ingredient in soup. It can also be shredded and used in salads. The leaves are used as seasoning; the small, fibrous stalks find only marginal use. The wild form of celery is known as “smallage”. It has a furrowed stalk with wedge-shaped leaves, the whole plant having a coarse, earthy taste, and a distinctive smell. The stalks are not usually eaten (except in soups or stews in French cuisine), but the leaves may be used in salads, and its seeds are those sold as a spice. 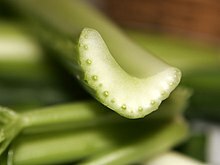 With cultivation and blanching, the stalks lose their acidic qualities and assume the mild, sweetish, aromatic taste particular to celery as a salad plant. Celery is used in weight loss diets, where it provides low-calorie dietary fiber bulk. Celery is often incorrectly thought to be a “negative-calorie food“, the digestion of which burns more calories than the body can obtain. In fact, eating celery provides positive net calories, with digestion consuming only a small proportion of the calories taken in. Celery contains phenolic acid, which is an antioxidant. Daniel Zohary and Maria Hopf note that celery leaves and inflorescences were part of the garlands found in the tomb of pharaoh Tutankhamun (died 1323 BC), and celery mericarps dated to the seventh century BC were recovered in the Heraion of Samos. 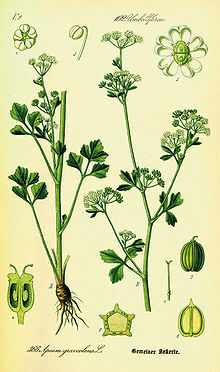 However, they note “since A. graveolens grows wild in these areas, it is hard to decide whether these remains represent wild or cultivated forms.” Only by classical times is it certain that celery was cultivated. M. Fragiska mentions an archeological find of celery dating to the 9th century BC, at Kastanas; however, the literary evidence for ancient Greece is far more abundant. In Homer‘s Iliad, the horses of the Myrmidons graze on wild celery that grows in the marshes of Troy, and in Odyssey, there is mention of the meadows of violet and wild celery surrounding the cave of Calypso. The name “celery” retraces the plant’s route of successive adoption in European cooking, as the English “celery” (1664) is derived from the French céleri coming from the Lombard term, seleri, from the Latin selinon, borrowed from Greek. Celery’s late arrival in the English kitchen is an end-product of the long tradition of seed selection needed to reduce the sap’s bitterness and increase its sugars. By 1699, John Evelyn could recommend it in his Acetaria. A Discourse of Sallets: “Sellery, apium Italicum, (and of the Petroseline Family) was formerly a stranger with us (nor very long since in Italy) is an hot and more generous sort of Macedonian Persley or Smallage… and for its high and grateful Taste is ever plac’d in the middle of the Grand Sallet, at our Great Men’s tables, and Praetors feasts, as the Grace of the whole Board”. Celery makes a minor appearance in colonial American gardens; its culinary limitations are reflected in the observation by the author of A Treatise on Gardening, by a Citizen of Virginia that it is “one of the species of parsley.” Its first extended treatment in print was in Bernard M’Mahon‘s American Gardener’s Calendar (1806). After the mid-19th century, continued selections for refined crisp texture and taste brought celery to American tables, where it was served in celery vases to be salted and eaten raw. Celery was so popular in the USA in the 1800s and early 1900s that the New York Public Library‘s historical menu archive shows that it was the third most popular dish in New York City menus during that time, behind only coffee and tea. In those days celery cost more than caviar, as it was difficult to cultivate. There were also many varieties of celery back then that are no longer around because they are difficult to grow and do not ship well. 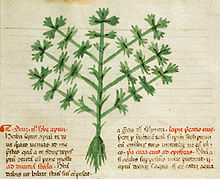 Apium illustration from Barbarus Apuleius’ Herbarium, c. 1400. In (TV series) Portlandia‘s ‘The Celery Incident’ episode (2014), actor Steve Buscemi plays an unlucky celery salesman who must fight for his job at the “Produce Sales Headquarters”, because celery sales are not up to par. Freelance writer and radio producer Maya Kroth produced a story about celery for the food podcast Proof (from America’s Test Kitchen) in 2018, and she appeared on The Sporkful podcast (also in 2018) to discuss the history of celery in the U.S.
^ “Apium graveolens“. Germplasm Resources Information Network (GRIN). Agricultural Research Service (ARS), United States Department of Agriculture (USDA). Retrieved March 31, 2016. ^ a b de Vilmorin, Roger L. (1950). “Pascal celery and its origin”. Journal of the New York Botanical Garden. 51 (602): 39–41. ^ Lewis, Charlton T.; Short, Charles (eds.). “selinon”. A Latin Dictionary. Perseus Digital Library, Tufts University. ^ Liddell, Henry George; Scott, Robert (eds.). “σέλινον”. A Greek-English Lexicon. Perseus Digital Library, Tufts University. ^ Watson, Molly. “All About Celery Root (Celeriac)”. localfoods.about.com. Retrieved 29 April 2014. ^ “eat celery root”. eattheseasons.com. 2010. Retrieved 29 April 2014. ^ Schuchert, Wolfgang. “Celeriac (Apium graveolens L. var. rapaceum)”. Crop Exhibition. Max Planck Institute for Plant Breeding Research. Archived from the original on 20 May 2012. Retrieved 28 January 2012. ^ Newman, Jacqueline (Fall 2006). “Chinese Celery”. Vegetables and Vegetarian Foods. 13 (3): 15–34. Retrieved 17 April 2017. ^ “Smallage”. Practically Edible: The World’s Biggest Food Encyclopedia. Archived from the original on 2008-10-10. Retrieved 2009-05-03. ^ Wellman, F (February 1937). “Control of Southern Celery Mosaic in Florida by Removing Weeds That Serve as Sources of Mosaic Infection”. United States Department of Agriculture. 54 (8): 1–16. Retrieved 21 April 2017. ^ Takele, Etaferahu. “Celery Production: Sample Costs and Profitability Analysis” (PDF). UC Davis. University of California Agriculture and Natural Resources. Retrieved 16 April 2017. ^ Rizzo, V (January 2009). “Effects of packaging on shelf life of fresh celery”. Journal of Food Engineering. 90 (1): 124–128. doi:10.1016/j.jfoodeng.2008.06.011. Retrieved 21 April 2017. ^ Cantwell, M; Suslow, T. (2002-06-10). “Celery: Recommendations for Maintaining Postharvest Quality”. Post-harvest technology research and information center. Archived from the original on 2008-04-23. Retrieved 2008-03-04. 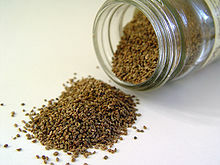 ^ “Complementary and Alternative Medicine Guide > Herb > Celery seed”. University of Maryland Medical Center. 2015-06-22. Retrieved 2018-02-15. ^ Celestin, J; Heiner, DC (1993). “Food-induced anaphylaxis”. The Western Journal of Medicine. 158 (6): 610–1. PMC 1311786. PMID 8337856. ^ Bublin, M.; Radauer, C; Wilson, IB; Kraft, D; Scheiner, O; Breiteneder, H; Hoffmann-Sommergruber, K (2003). “Cross-reactive N-glycans of Api g 5, a high molecular weight glycoprotein allergen from celery, are required for immunoglobulin E binding and activation of effector cells from allergic patients”. The FASEB Journal. 17 (12): 1697–9. doi:10.1096/fj.02-0872fje. PMID 12958180. ^ “Food labelling and packaging in international trade”. General labelling standards for the UK and EU. ^ Zidorn, Christian; Jöhrer, Karin; Ganzera, Markus; Schubert, Birthe; Sigmund, Elisabeth Maria; Mader, Judith; Greil, Richard; Ellmerer, Ernst P.; Stuppner, Hermann (2005). “Polyacetylenes from the Apiaceae Vegetables Carrot, Celery, Fennel, Parsley, and Parsnip and Their Cytotoxic Activities”. Journal of Agricultural and Food Chemistry. 53 (7): 2518–23. doi:10.1021/jf048041s. PMID 15796588. ^ Yang, Yao (2010). “Phenolic Composition and Antioxidant Activities of 11 Celery Cultivars”. Journal of Food Science. 75 (1): C9–C13. doi:10.1111/j.1750-3841.2009.01392.x. PMID 20492156. ^ Wilson, Charles Welthy III (1970). 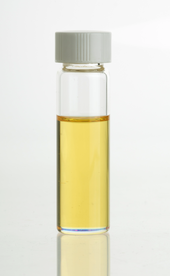 “Relative recovery and identification of carbonyl compounds from celery essential oil”. Journal of Food Science. 35 (6): 766–768. doi:10.1111/j.1365-2621.1970.tb01989.x. ^ a b Megaloudi, Fragiska (2005). “Wild and Cultivated Vegetables, Herbs and Spices in Greek Antiquity (900 B.C. to 400 B.C.)”. Environmental Archaeology. 10 (1): 73–82. doi:10.1179/146141005790083858. ^ Evelyn, J. (2005) . Acetaria: A Discourse of Sallets. B. Tooke; The Women’s Auxiliary of Brooklyn Botanic Garden; Project Gutenberg. ^ “When Celery Was More Special Than Caviar”. Sporkful podcast. ^ “Watch Portlandia’s ‘The Celery Incident‘“. Eater.com. ^ “Portlandia Is Back with ‘The Celery Incident““. IFC. El-Shinnawy, Nashwa (1 February 2013). “The therapeutic applications of celery oil seed extract on the plasticizer di(2-ethylhexyl) phthalate toxicity”. Toxicology and Industrial Health. 31 (4): 355–366. doi:10.1177/0748233713475515. PMID 23377116. Retrieved 30 April 2015. “Celery” . Encyclopædia Britannica. 5 (11th ed.). 1911.